I hadn’t been to Ditchling Common in December before and was surprised to see frost and ice on the ground on a day when it must have been about 10 degrees warmer in Brighton and which still hadn’t melted by sunset. The light faded quickly in late afternoon and just as I was leaving, I caught sight of bare stalks of cow parsley, devoid of seeds, standing out graphically against the winter sky. 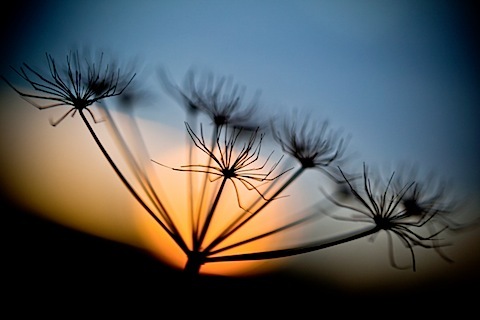 The sun had set leaving a band of orange against the horizon but an aperture of f2.8 created an orange disc behind the silhouetted cow parsley giving the appearance of a setting sun.